Need a little treat? Pineapple ice cream with a dusting of shredded coconut and cacao nibs satisfies any sweet tooth…without the fat and processed sugar! Three basic ingredients, all pure foods, whipped up into a creamy frozen dessert that couldn’t be easier to make. Recipe and photo contributed by Cristina Cavanaugh, from Begin Within Nutrition. 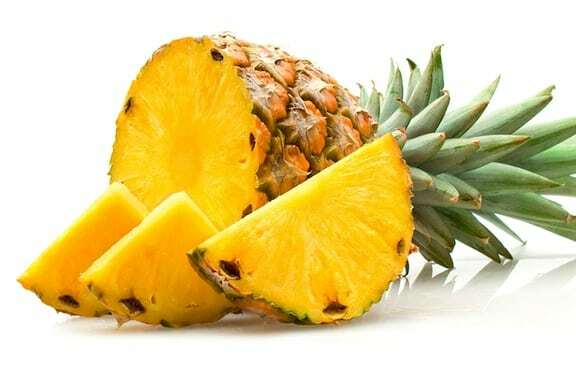 Freeze the pineapple for several hours or overnight, until completely frozen. Combine the pineapple, nondairy milk, and sweetener in a food processor and blend until the mixture has a smooth ice cream consistency is formed. You can also use the frozen dessert setting on a high-speed blender like Vitamix or Blendtec. 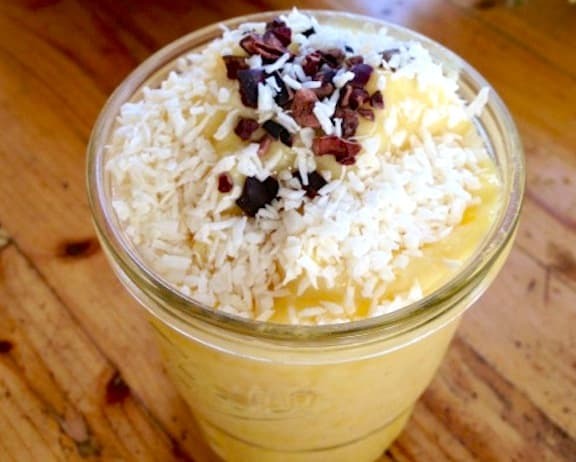 Top with shredded coconut flakes and cacao nibs, if you’d like. Enjoy more of VegKitchen’s Vegan Ice Cream recipes. been waiting to get the ingredients, then wait until the pineapple freezes, and finally had this earlier – it’s delicious !!! !